This program includes 4 MODULES OF STUDY / 2 WEEKENDS PER MODULE and begins July 26th, 2018! Increase self-knowledge, acceptance and love through advanced studies in “embodied-inquiry”, asana, mantra, pranayama, meditation and philosophy. Embodyoga®-inspired programs are well-rounded, in-depth studies of yoga with an emphasis on deepening personal embodiment as the basis for developing depth and power as a teacher. Learn to teach embodied-inquiry practices and share the depth of this experience with your students through Precision Alignment and Vinyasa Hatha Yoga, Mantra, Mudra, Meditation, and Pranayama practices. Serious yoga students are invited to attend individual modules of this training for the purposes of advanced study. This program builds on the foundation of the 200-Hour Teacher Training Program providing an additional 300 hours of study. All 4 Modules constitute a complete 500-Hour Certificate Program. The Certificate Program is open to yoga teachers with a 200-Hour Certificate from any Nationally Registered Yoga School. 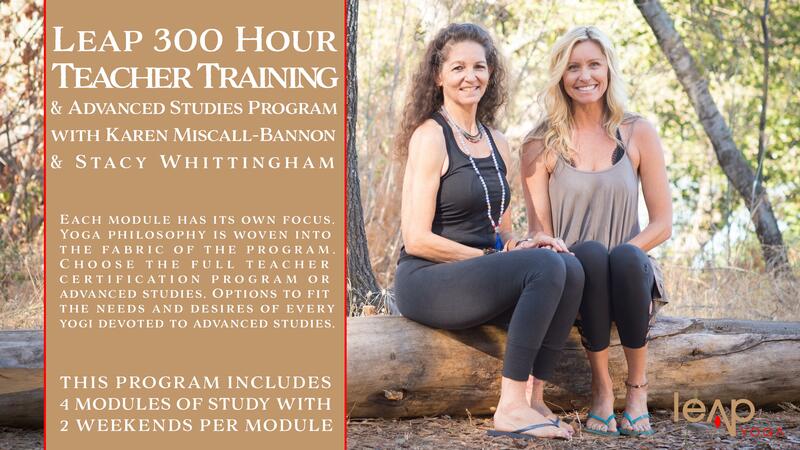 This is a highly rewarding study for serious yoga practitioners and teachers alike. Define and clarify the principles for healthy support and movement of bones, muscles, tendons, ligaments and joints. Create ease and integrate the forces of movement and support throughout your whole bod-mind. Learning to support ourselves with the whole body encourages the experience of Unity at all levels of being. Included: advanced practices in standing postures, arm balances, inversions, pranayama and meditation. Learn to feel your own organs and glands. Discover how to initiate movement from them. Learn to access these systems through asana, mantra, pranayama and meditation. Yoga is a developmental process of growth toward the experience of Unity. In this module we explore the movement patterns that support our experience of wholeness and connection to source. We integrate these patterns into our asana practice, and gain a deeper understanding of the various practices of Yoga. Define and clarify the principles for healthy support and movement of bones, muscles, tendons, ligaments and joints. Create ease and integrate the forces of movement and support throughout your whole-body. Fascia as communication organ and supports via the fascia meridians. Module 4 is the culmination of the 300-Hr. Training. Successful completion of Modules 1-3 is required for attendance in this module.